Different interpretations have been offered regarding the identities of the ten kings. However, Revelation does not tell us who they are. All we can derive from the text is that they are a short-lived political confederacy appearing right before the end and supporting the harlot. Their number signifies that the world powers will render total, unwavering allegiance to the beast. Revelation 17:13-14 reiterates in a nutshell the battle of Armageddon – introduced in Revelation 16:12-16. Induced by miracle-working demonic powers in conjunction with the dragon, the sea beast, and the false prophet, the worldwide political confederacy will make war with the Lamb. In other words, the battle of Armageddon is not a military battle in the Middle East but the final conflict of the Second Coming in which Satan and his confederacy fight against Christ and His angelic host. Northern Ireland has been a trouble spot for several centuries but during the latter half of the 20th century, the violence increased to the extent that over 3000 people were killed. Although the issues were more complex than I want to discuss here, a fair portion of the conflict was fueled by sectarian violence. Protestant groups faced off against Catholics and goaded one another until physical combat ensued. One of the main figures in this period was a rather vocal minister of the Free Presbyterian Church of Ireland, Ian Paisley. He was a fundamentalist and among other things, preached strongly worded sermons against the Roman Catholic Church. Much of what he said in this area was rather similar to what Seventh-day Adventist teach. Here is a question, pertinent to the current discussion. Is there a fundamental difference between Ian Paisley and Seventh-day Adventists in what we preach and practice? A pastor in our church years back, can't recall if it was late 1800 or early 1900, is largely responsible for the way we do evangelism and express the symbols in Revelation today. It was a time when anti-Catholic sentiment was running very high and the messages made a huge impact. MUCH has changed since then, but we continue to preach that old message. We have failed to change with the times and often our focus on the Catholic Church has not been effective in leading people to our message. We can, and often do, come across very harsh and frankly misrepresent the matter at times. Elder Jon Pauline has a great message on that for which I have not link for right now. But the message the church could benefit from so we are less sounding of Paisley. There are ways to share that are much less caustic as it often times comes across as without lessen the impact of the message. He also has blog where he comments on changes made to his Teacher's comments and Ranko Stefanovic's original manuscript for this series. Thank you, Shirley. I am aware of Jon's site and the current blog. All excellent material. When I can think of the title of the message I elude to in my post, I will be able to narrow down the search for a link to it (I am not aware of any link on his website to the message). It's a great message that is pulled from Jon's own personal experience as a pastor doing evangelism and later as a scholar involved in discussions with other denominations. Brother Ashton, I know of NO place where the Adventists have stood in arms to fight on the basis of religious teachings. Our SWORD is the word of God, and it is a sword anyway, it CUTS Eph. 6; Heb. 4:12. We do not use the civil sword to impose our beliefs on others (Rom. 13:1-3), as per the example you have given. The Holy Spirit does the convictions. The BABYLONIAN system is CONDEMNED according to the 2nd angel's message, and that is why there is a call to COME OUT OF HER, My people - God says. The urge by the Spirit of Prophecy is ""We are pressing on to the final conflict, and this is no time to compromise. It is no time to hide your colors. When the battle wages sore, let no one turn traitor. It is no time to lay down or conceal our weapons, and give Satan the advantage in the warfare. But unless you watch, and keep your garments unspotted from the world, you will not stand true to your Captain. It is no time for watchmen to slumber on the walls of Zion. Let them be wide-awake. Call to your fellow-watchmen, crying, “The morning cometh, and also the night.” It is no time now to relax our efforts, to become tame and spiritless; no time to hide our light under a bushel, to speak smooth things, to prophesy deceit." EG WHite 1888 materials p.1077. If we really love our fellow human beings, we would give them the warnings of what is soon to take place around us. I thinks so, how else can I demonstrate love to someone on a path to perdition by criticizing the warning signs and pulling them down, when this individual's life is in danger? I was not asking about standing in arms to fight. My concern is: how is our message fundamentally different to the Paisley message? I believe it is different and I would like readers to express that difference. I am guessing that most of us on this blog have lived through the Northern Ireland "Troubles" period, even though may not have been directly affected by it. How is the message in Revelation different to Paisley? don't know really what his messages was aside from being "Catholics are bad"
I think we should compare what we know about the 3 angels message as compared to the 3 frogs message, realizing that because of the dragon component it includes all religions from pagan, eastern, spiritualism, Islam, Jews and Christian etc. 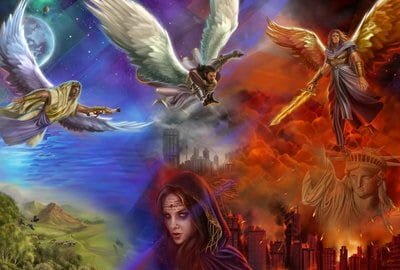 Because the 3 angels message points out the difference these religions - Babylon - satanic triad - the harlot enlist the secular world to war against the Lamb. As long as Jesus is always in our heart His grace is transforming us into a loving person like Him, with this we could be fulfilling what is mention above that we would be more than willing to be God's instrument in giving his warning of love to our fellow men, so if possible everybody will be save into God's kingdom. As our knowledge, faith, and love to Jesus is growing so with our witness for Him is progressing. Ops, I believe future because part of the judgement is Jesus' coming. Below is my understanding of the story Revelation is telling us put in order. Rev 12 - 19 are not chronological - it gives a nutshell in Rev 12 and then jumps back and forth highlighting different sections. 1) land beast, with a hidden agenda, deceives the inhabitants of the earth to set up an 'independent' civil/military power to solve a worldwide crisis. 9) at midnight the Lamb comes to deliver His people and destroy those who made war against Him. Ops Andrew Lalo. Answer is: Yet to come. I believe, Armageddon is the final judgement, where turmoil and utter confusion comes upon the earth after probation closes. After the saints have been delivered by the voice of God, the wicked multitude turned their rage upon one another. The earth seemed to be deluged with blood, and dead bodies were from one end of it to the other. Has the time of close of probation come yet? No. Has Armageddon(a figurative name) come yet? No. Is Armageddon the judgement of Babylon? I believe so. This is where God defeats Satans last push just before Christ’s second coming. On God’s side all will survive, and the other side there will be no survivors. We now daily turn our lives over to Christ, so as to NOT be caught in a false sense of security, and are left behind. “Look, I come like a thief! Blessed is the one who stays awake and remains clothed, so as not to go naked and be shamefully exposed.” ‭‭Revelation ‬ ‭16:15‬ ‭NIV‬‬. We have no fear, because our faith is anchored in Jesus Christ. I put my trust in God because, in my study of the Bible I have found He has always given men warning of coming judgments. Those who had faith in His message for their time, and who acted out their faith, in obedience to His commandments, escaped the judgments that fell upon the disobedient and unbelieving. Let’s stay awake and remain clothed(a figure of speech) talking about: Ephesians 6:10-20. A very good question, Ops. In context the chapters of 16, 17 and 18 go together, and keeping that in mind the answer becomes pretty clear. The close of probation is signified in that no man could enter the temple due to the presence of the glory of God in it (chapter 15). At this point, the close of mediation has come, which makes way for the bowl plagues to commence. As the plagues reveal the house of cards for which Babylon is built, the people begin to withdraw support (drying of the Euphrates), and a final counterfeit is employed by the counterfeit trinity to rally that loss of support back, and is done in the assembly for the battle of Armageddon. That battle is the war of the kings of the earth against Christ for which Jesus comes to the rescue of His people in the seventh plague, the second coming, which is the battle of Armageddon itself. Just before the coming of Jesus the kings turn on the woman Babylon, but the woman is also designated as the city of Babylon the Great (see Revelation 17:18). In the narrative concerning the city (chapter 18) we discover that the city receives the plagues in a day and her judgment takes place in one hour. Thus, the plagues and the judgment are still future. They come at the very end of time. Presently we are in the seal and trumpet time. The trumpets are limited judgments upon earth dwellers. Judgments mixed with mercy, seeking to arouse them to their danger and turn to God before it is too late. So, as Babylon is being built so to speak in this day, limited judgments are taking place at the same time. So there is a sense that judgments are in the present, but that mentioned in this week's lesson are those in the future. And number 10 refers to totality as opposed to numerical 10. Here are several verses to help the concept sink in: Gen 24:10 - 10 camels represent ALL of Abraham's goods; Luke 19:13 - ten servants represent all of Christ's professed followers; Dan 1:14, 15 - the young men tested for 10 days; Daniel 1:20 - the young men are 10 times better; Matt 25:1 - 10 virgins - representing all God's professed people; 10% of tithe to confess that all belongs to God; 10 commandments to express the whole duty of man. So what do the 10 kings (kingdoms) represent? This is the totality of civil leadership. Their love affair with the harlot will not always be there, for they will turn against her (Rev 17:15,16). Not only will the RULERS turn against the religious leaders, but multitudes which compose these kingdoms will turn against the harlot. This HATRED against the harlot is referred to as prophetically as the WATERS DRYING UP. I heard something quite simple. At the end, the important thing about this whole message is that there will be people on the side of the Truth and people on the side of situation! Which side will you and me want to stand for? No matter what the name of the religious system we follow, the important thing is to be sure that the Truth is not something relative, it is something absolut! There is the Truth. And the Truth is Jesus, wich is the most perfect representation of love! God is love! In being founded on Jesus our love does recognize the Truth. The religious system is not as important as Jesus, the Truth! Thus we must follow His Voice, not of men's! Revelation says that the plagues of Babylon will come in one day and judgment in one hour (Revelation 18:4, 8, 10, 17, 19). Hence, when we read the plagues we are witnessing the judgments upon this elaborate human system that has been carefully crafted and honed for millennia, being exposed for what it really is, a house of cards. The system cannot provide protection from the devastating affects of the bowls being poured out upon it. This global system of trade, religious unity, and political alliances has brought tremendous wealth and prestige, perhaps even a strong illusion of "peace," and it is celebrated as a huge achievement by the earth-dwellers. It is why they can, through their system, demand worship of it. They have created and empowered it. A millennia to create this system is lost in an hour, a very short period of time. What looks to be invincible (you great city, you mighty city...great wealth gained by her), she has provided so much, achieved great wealth for which others enriched themselves, is now proven to be but dust. Finally, due to the second coming of Jesus (seventh plague), the city fractures into three parts (unity busted up) and she collapses in a frothing hiss as a mill stone is tossed into the sea. This tragic temporary fame is to shake us to look to the other city, New Jerusalem, and do all that can be done to be a part of it. In stark contrast to Babylon's shimmering cellophane grandeur, the glory of the New Jerusalem is unsurpassed. She is adorned in richest of beauty and inhabited by people changed by the Lamb who enjoy true unity in love for Christ and each other. No cut throat competition in this city. All liars and those that commit violence and evil are not there. She endures in a context of self renouncing love. As a famed preacher in the SDA church has said, "It is worth everything we give up in this life to be a part of that one!" Like you Barb, I hope love is the distinction. Practicing that distinction is the hard bit and we need to ensure that it is foremost in our interaction with others. There is only one God, one Lord, one Lifegiver. As we surrender and obey Him by the power of His Spirit and trust His promises, we are under His powerful wings, secure and preserved to exist in His presence. To me this whole lesson is about God. His judgement of Babylon. The whole system of Babylon is corrupt from God's viewpoint. There is nothing in the Catholic church which is in harmony with the Biblical teaching of righteousness by the Faith of Jesus. Jesus is our Saviour. He appears before God for us because we cannot. If we do not have the Love of God in us, we do have that Love, we are not His. 1 John 4:7-8.